Remember when I talked about the Washington Post photographer who spent the morning with us, following Jonathan for an upcoming feature in the paper? It is to be published tomorrow (Saturday, April 14), but it’s already online. Check it out! I especially liked the pictures he had of people with the animals. The one with Monty really struck a chord for me. It is so tender! Monty is a love. 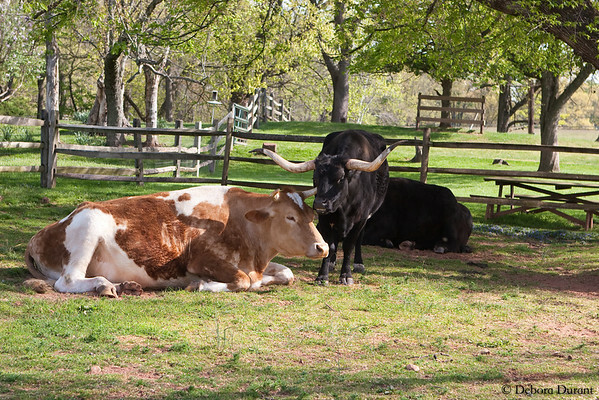 Jacob is the bigger one, and Emily is the blind cow who came a couple years ago. You can’t actually see it in the picture, but he was licking her neck. Very sweet! In the pig yard we always joke around about practicing for the poop catching olympics. It’s a special talent to catch the poop in action, so to speak, and it’s quite efficient also to let the poop land on your rake and put it into the bucket, rather than having the ground as a middle man. Ben upped the game last weekend. He caught Harley’s poop directly into the bucket! Pretty sure Harley is grinning. She’s so cute. I think that she’ll lose the “curly” hair when she sheds her winter coat, but in the meantime, it is so adorable! In the chicken yard, Dusty wandered by where Jonathan and I were petting Tilly. I take a lot of pictures of Dusty, I admit! This past year, my parents gave me a gift of two chicken sponsorships. I’d been asking for a sponsorship of an animal at the sanctuary for years, and they never went for it. This year, in frustration, I put nothing else on my wish list. I guess that did the trick! I had to choose two chickens for the official sponsorship, and that was hard for me. I try to not have favorites. I love them all, and I want to get to know them all, and having favorites just feels wrong for me. I decided on Alina right away (because who doesn’t want to cuddle that little ball of sweetness? but also because she’d had a bit of a fight with a rooster I’m sponsoring for my dad (they have the same name) and her eye was injured…) and then took about three months to decide on who else. Finally, I decided on Dusty. I’m not really sure what went into that decision, other than I’d been focused on getting a nice picture of her for a few weeks, so she was on my mind. And now that I’m sponsoring her, I notice her even more, which leads to taking more pictures of her. As I looked at the pictures I’d gotten last weekend, I noticed that in one of them her nictitating membrane (aka “third eyelid”) was closed. This happens fairly often when taking pictures of the birds at the sanctuary, and it’s one of the reasons that I tend to take pictures on “burst mode” (also that they tend to dart around, and move their head very quickly). I usually just pass those pics by. But then I saw that I had a third picture with the nictitating membrane only half closed! And that was pretty cool. The nictitating membrane is a very cool adaptation. I think it would come in handy on the bike as well, but humans aren’t so lucky! I didn’t find out Dusty’s story until after I started sponsoring her. She was found in back of an apartment complex. A woman heard peeping, which led her to Dusty, a tiny chick at the time. 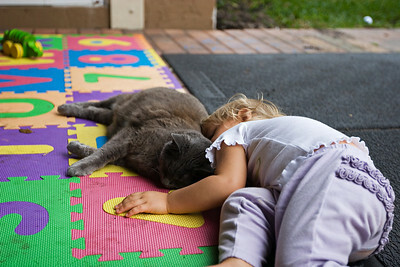 Luckily for Dusty, the woman took her in. There is very little chance she’d have survived the night – too many predators, too many dangers. Though we don’t know Dusty’s story prior to her rescue, we do know that being dumped in a field is a very common fate for the hatching project chicks. Helpless on their own, they will approach anyone, hoping to be cared for. They won’t last even one night alone. On our way back to our cars, Jonathan stopped to play with Josie again. It is so awesome to see them playing together! He’ll be out of town this weekend, but maybe we’ll be able to imitate him enough to satisfy Josie. I took loads of pics, hoping some of them would come out. 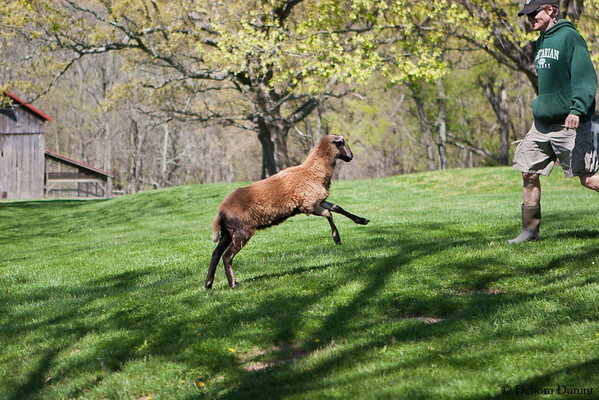 Hard to know what you’ll get when you have an active little lamb leaping all over the place! I was really excited I ended up with quite a few really nice ones, and a couple where Josie is completely in the air. Levitating! I read a lot, mostly fiction, and over the past five years or so I’ve noticed the occasional vegan character creeping in. Of course they’re always portrayed negatively, or at least ignorantly. The people writing the books are clueless about veganism, about animal rights, about what it would be like to BE a person acting on these ethics…and so they have the most superficial portrayal, filled with every stupid stereotype you can imagine. But when I heard about Marla Rose’s recently published book, I definitely wanted to read it. A vegan character written BY a vegan is a whole other ballgame! I had a momentary hesitation upon learning that it was a YA book – I’ve read some and loved some, but YA isn’t what I gravitate toward. But I got it and read it anyway, and I’m glad I did. I wrote a review over at Animal Rights & AntiOppression: “Review: The Adventures of Vivian Sharpe, Vegan Superhero“. 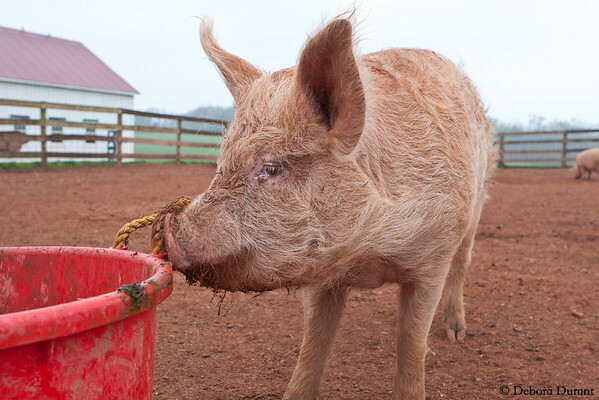 Clover was bottle-raised at the sanctuary from the time he was just a couple days old. He was abandoned by his mother, and the (local small family) farmer was just going to leave him to die. Instead, he was brought to the sanctuary. 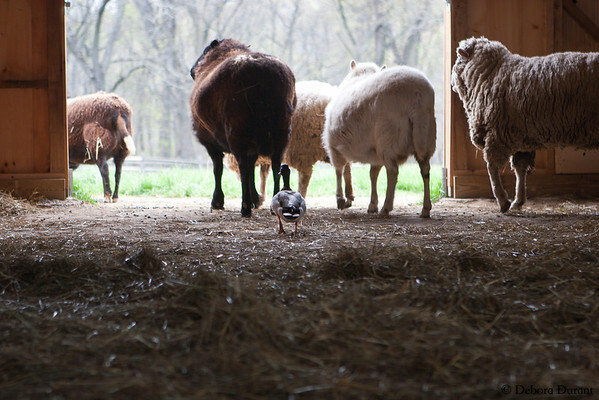 Since he was raised by people at the sanctuary, he is less wary of humans than many of the sheep are. 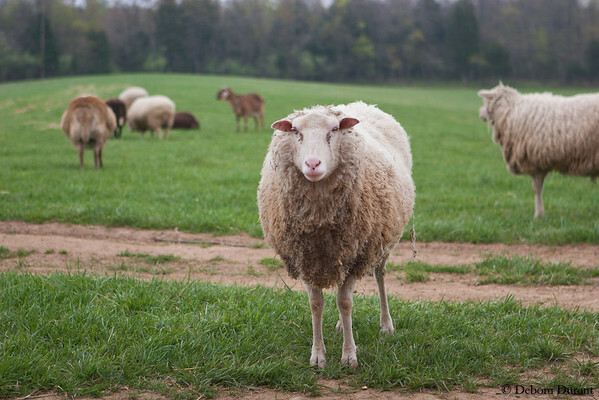 But a smart sheep is still one who sticks to the herd most of the time, so if something alarms the herd and they start moving off, he’ll go with them. However, when the herd is comfortable, he will often come over to investigate us. Possibly hoping for treats! Harley is almost all grown up now, at 3.5 years old. His rescue story no longer shows up on the links, which is a shame. Wish I’d thought to stick it in a document offline! But the basics of his story showcase how lucky he was – on his way to auction as a tiny baby, he fell off the transport truck, was rescued by people who have an education center of some kind, but who didn’t have the room for a full grown pig, and so his fate might have been a slaughterhouse in the end if it weren’t for random visitors to the education center who contacted Poplar Spring and facilitated the rescue and helped with the transport. 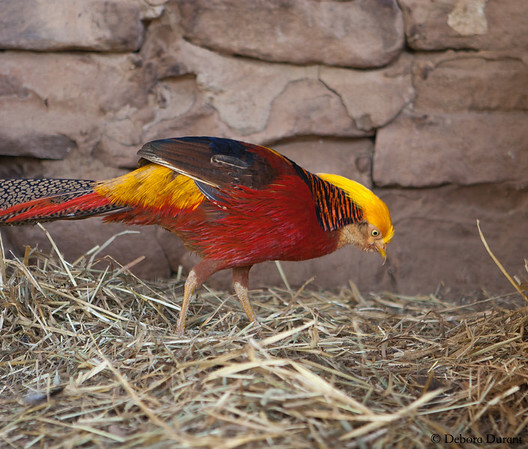 Uri, a Golden Pheasant. I've been trying for ages to get a decent picture of this guy! Now, for something super-cute – a video of Jonathan and Josie playing! Josie does a few jump-and-kicks for your viewing pleasure. Marius is a trip. He’s been checked for (ahem) hidden testosterone producers several times, but he’s definitely not an intact male, yet he is fairly relentless when it comes to his pursuit of the ladies. 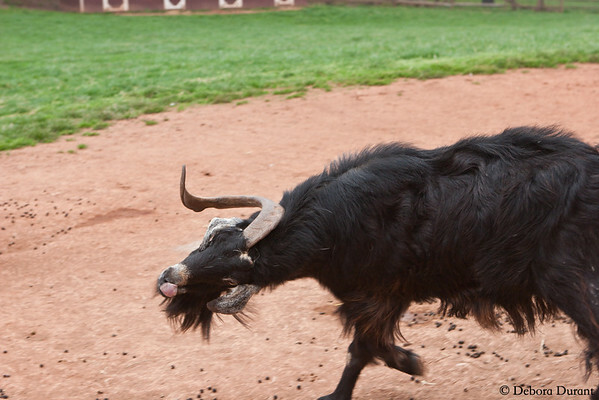 He’ll chase all of the other male goats away, while also chasing after the girls with his weird tongue waggle. A video from about a year ago gives you the benefit of hearing him too! Sometimes he’ll do a sort of snorting sneeze, which in goats can be part of the seduction routine, or can just mean they’re happy. 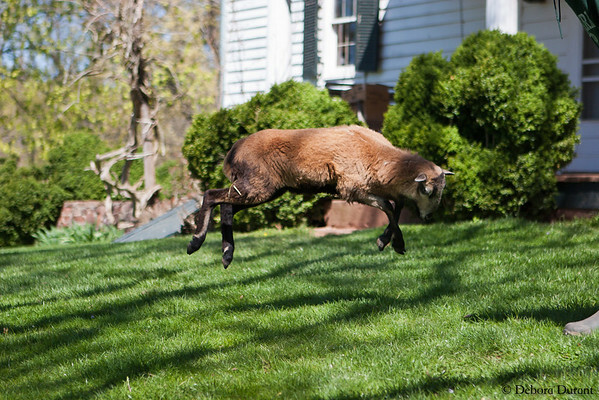 My google skills aren’t up to par tonight, because I can’t find much in the way of articles on this type of goat behavior (or maybe I need to use a different search engine now that google is evil? ), but I did run across this very interesting article on Goats and Cows, written by Maneka Gandhi and published by an Animal Welfare organization in India. 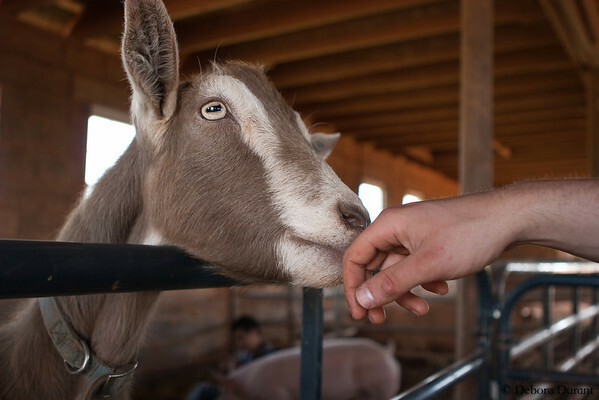 It does talk about the goat sneezes, as well as the tongue waggling, but it also talks about their personalities, and it makes some important connections. How odd that we value our dogs so much but we do not think twice before eating goats – which are kept like pets all over the world and are as intelligent, loyal and emotional as them. Goats are very often not given credit for being the smart and loving creatures they actually are. Think of them like dogs, except they don’t have the “I must please humans” thing that dogs have. It is not for nothing that human children are called kids – a term that means baby goat. Baby goats love playing hide and seek. They crawl into little hidey holes and will lie very quiet and jump about squealing when you find them. They “explore their world” with their mouths just like human babies “chewing” and “mouthing” things to learn about them. They love climbing. Family members let their babies jump and climb on them. If you let them climb on you, you are considered family some of the activities enjoyed by kids include galloping, jumping vertically into the air, tossing their heads, and whirling around. When you next have a steak or wear new leather shoes, remember that this cow could articulate her pain. We are just not smart enough to understand her voice. John Webster, professor of animal husbandry at Bristol, has just published a book on the topic, Animal Welfare: Limping Towards Eden. “People have assumed that because animals have smaller brains they suffer less than humans. That is a pathetic piece of logic,” he says. Every time you choose to buy leather or drink milk you kill a gentle intelligent sensitive being. 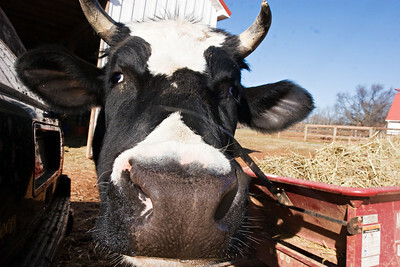 Cows are not just oblivious, cud chewing milk machines – those terms can be more aptly applied to so many humans instead. Aggie, our newest rescue, is a young Red short horn calf. She most likely escaped from the livestock auction, because she appeared at a home about a mile from the auction on sale day, as a tiny one month old calf. It seems she followed the railroad tracks to a farm where luckily a kind woman made the efforts to find her a sanctuary home. The local sheriff’s dept. and animal control wanted to take her and sell her for slaughter, but the woman kept her safe for several months until she was tame enough to lead onto a trailer. We picked her up yesterday, and she is very friendly and sweet, she loves to lick people. 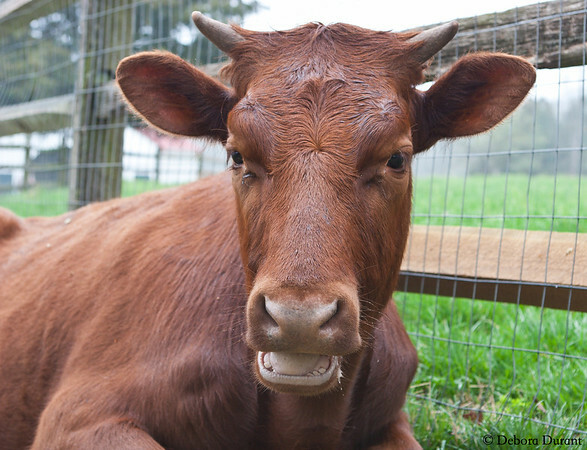 We can’t wait to introduce her to the other rescued cows, and here she will be able to spend the rest of her life in peace and happiness. 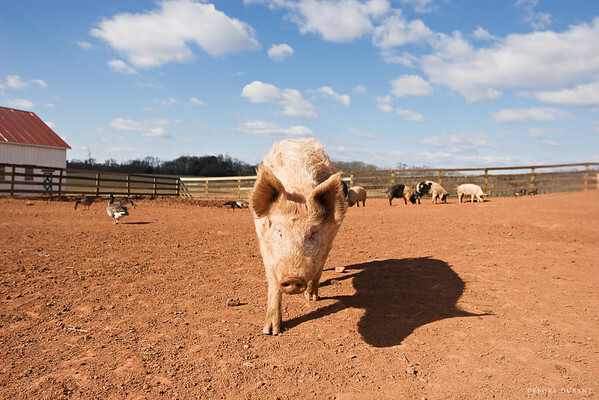 The pig yard was in great shape – we always end up talking about the pig yard conditions, because it makes a huge difference in how hard or easy it is to clean the pig yard. Last week was perfect. And as I scooped, I had a chance to get a picture of the cutest pig nose in the world. Paige came with another little piglet, Patty, about 9 months ago, and they both have curly (for pigs) hair for their winter coat! It’s adorable. Aren’t they cute? They are still the littlest ones at the sanctuary! Now that I’ve spent some time with Brenda Lee, I notice her right away. It’s funny how that happens – what used to be the general group of “beta barn girls” to me, are now distinct hens who I distinguish easily, though I don’t know their names yet. And that’s the essence of an awakening to the individuality of others, isn’t it? All it takes is that small starting point, noticing, recognizing, and suddenly a whole new vista opens up. It’s a mirror of the awakening we go through when we realize that we must go vegan. Spring in the DC area is very pretty (if you don’t have allergies) with lots of flowering plants and trees. Last week was the peak of the Cherry Blossoms, which is a pretty big deal because there are so many of them – something like 3700 just in the Tidal Basin area of DC itself, and many more all over the DC metro area. Most of the ones I see are planted as part of landscaping in people’s yards, or bordering developments. There is only one at the sanctuary (that I have seen – I haven’t walked through the woods to see if there are others! ), and it is a wild cherry tree. I don’t know enough about cherry trees to be able to talk about them in great detail, but I do know that most of the ones I see – the ones that are part of the landscaping – are more like the ones down in the Tidal Basin – the ones gifted by Japan. There are many species of cherry tree, however, and some of them are native to North America, as the wild cherry tree at the sanctuary is. It just so happened that Dexter was wandering around down near the wild cherry tree, so I wanted to try to get a portrait of him with the blooming cherry tree in the background. It was a marginal success. 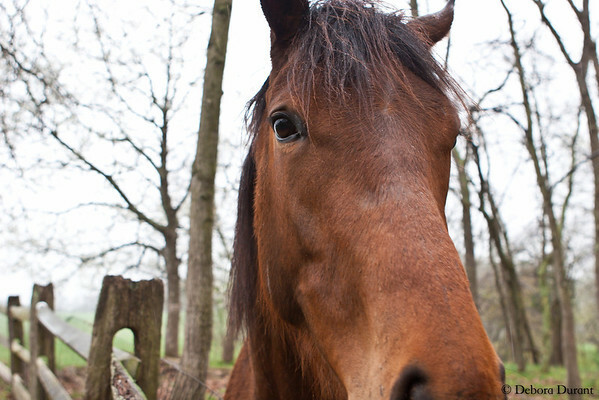 An overcast day, a horse who wasn’t really with the whole “hold still and pose” program…well, you’ll have to trust my word that the vague fluffy white stuff on the upper left side of the picture is, indeed, the wild cherry tree’s blossoms! 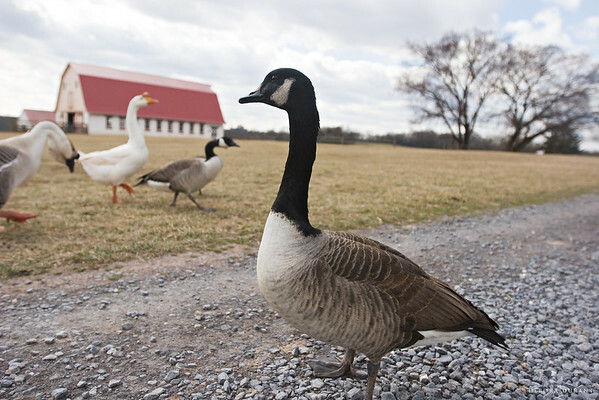 As we were leaving after chores, I stopped to take a picture of four recent arrivals – domestic geese whose story I have forgotten for the moment. 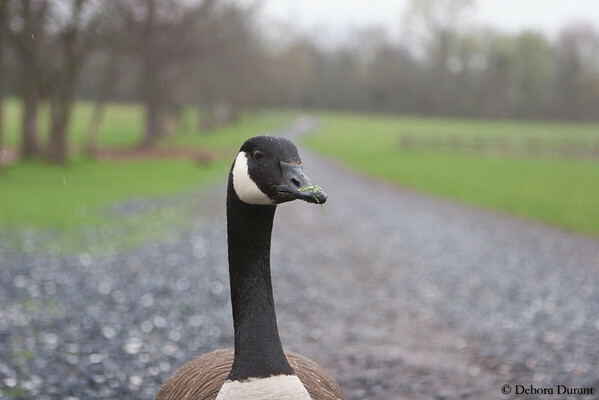 As I knelt there, this Canadian goose walked up to me. I imagine she was hoping I had something tasty for her, instead of just a big clunky camera! So cute, with all that grass on her beak! 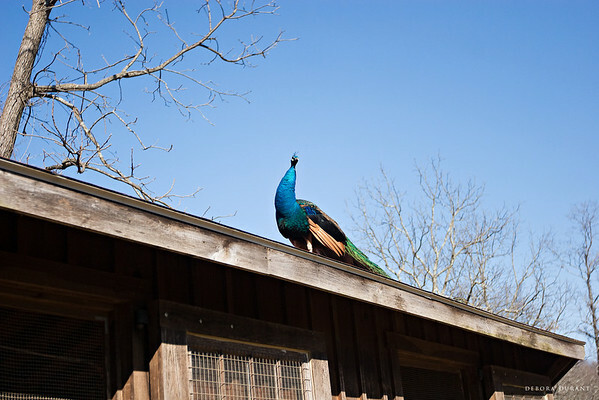 It was a sunny day at the sanctuary last Saturday, but very very windy. 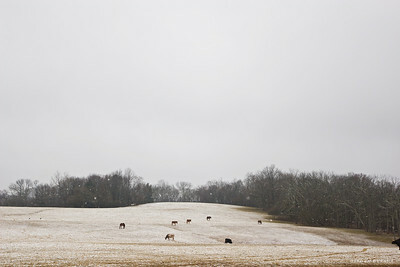 The wind made it cold for us humans, though most of the animals seemed to think it was just fine. 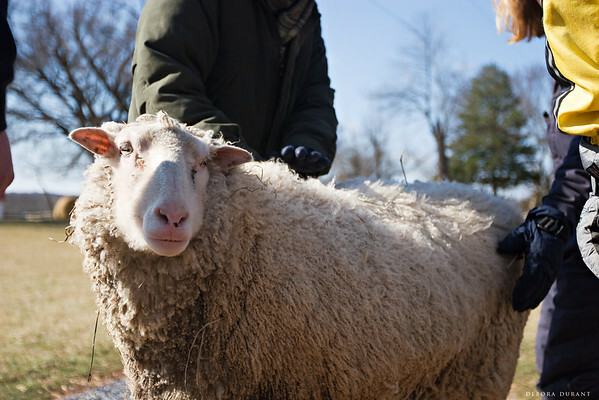 Adam is one of the friendlier sheep, bottle raised at the sanctuary from just a few days old, and thus more comfortable with humans than many of the sheep are. He’ll still move off with the herd, but he’s also one of the first to approach humans. Saturday was a good example. Everyone loves to give Adam attention because if you pet him just right, he wags his tail. It’s a big disappointment when people don’t get the tail wag, but I wouldn’t be surprised if Adam holds out sometimes to make sure people keep trying, and thus keep petting him. In the pig yard, I framed a shot to document how beautifully blue the sky was and how beautifully dry and smooth the pig yard was. That might sound odd to those who have not waded through thick clay mud or haven’t tried to spear frozen poo pellets out of frozen divots, so you’ll have to trust me – the pig yard was a beautiful thing last weekend! Of course as I took the picture little Patty came trotting over. I’m pretty sure she thought I might have a treat for her, but since I didn’t (and she sniffed the camera thoroughly to make sure), she trotted on past me. The wind was so strong that we didn’t let any of the birds out into the chicken yard. Not that they would have wanted to be out there anyway with that wind! It gave me a chance to get an interesting pair of shots of Arthur, the younger peacock, inside the barn. 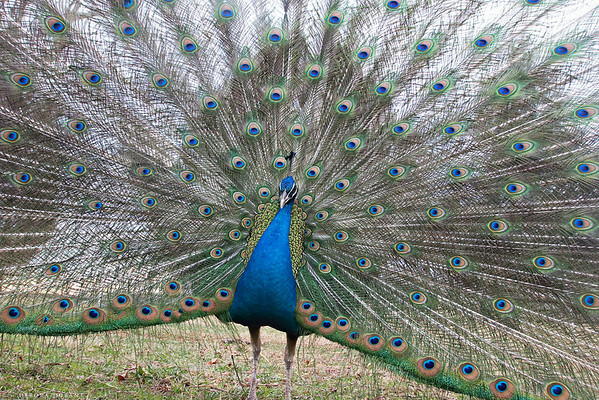 Most people think of brilliantly colored feathers when they think of peacocks. 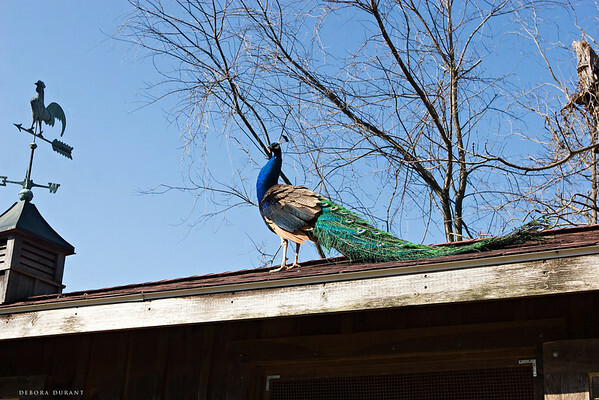 Fair enough, they do have brilliantly colored feathers…but only when the light is hitting them right. 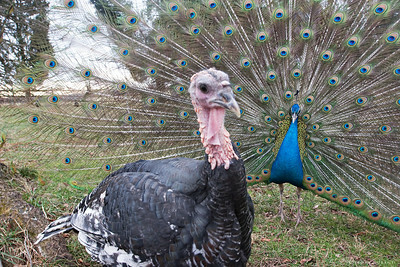 So this pair of pictures perfectly illustrates what a dramatic impact the light has on the appearance of their feathers. Same bird, same day, same camera settings, same sunlight, and I was in exactly the same place for each shot…the only difference is the direction Arthur was facing. Up by the gift shop, Nobby came to see us with his two girls, followed by Nelson and his girl, Isa. Such odd couples, but who are we to argue with true love? Meanwhile, on the other side of the country, an enormous rescue of over 4,000 hens took place after a farmer left “his” 50,000 egg-laying hens to starve to death when he could not afford to feed them. 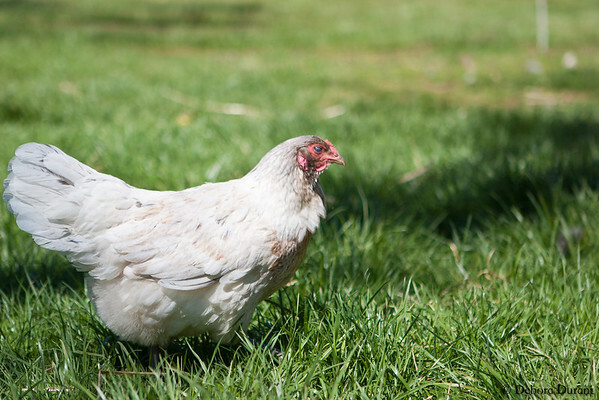 The Turlock Hen Rescue, as it has come to be known. 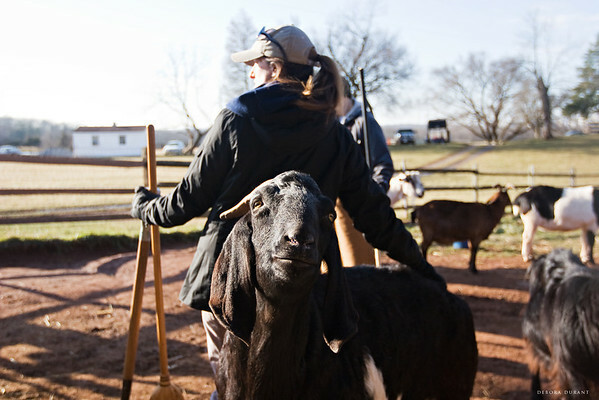 Animal Place took most of the hens, and Harvest Home Animal Sanctuary took a smaller number. For perspective, at Poplar Spring the bird population hovers at around 60, if I recall correctly. That’s the number they’ve determined they can house based on the barn space that is available. 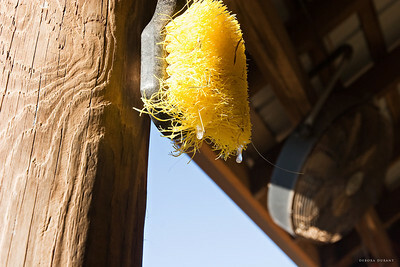 As someone who helps clean the barns every Saturday, I can say that it’s a good amount of work. 4,000 is a number I can hardly comprehend. Suffice to say that Animal Place especially (but the others who have taken some also) has their hands full. If you can help them out, now’s a good time to do so. Even if you can’t help out financially or in person, go read about the rescue, about the fifteen hens saved from the manure pit at the chicken farm, the hens going outside for the first time, and re-learning how to eat. And go vegan. Their lives prior to rescue are beyond what any of us can truly imagine. But now that they are rescued we can start to imagine what the rest of their lives will look like, and it will be good. They are why we are vegan. Every year at the Poplar Spring events, people ask questions about the peacocks that I often can’t answer. 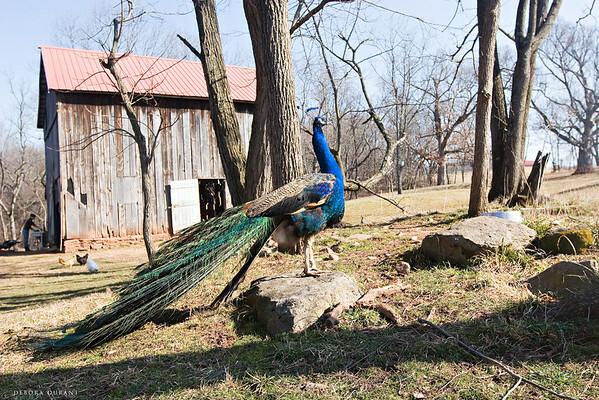 I know the stories of how Edward and Arthur came to live at the sanctuary, but I don’t know that much general information about peacocks, or how they would be in the wild. A friend has been traveling in India recently, and he posted a few pictures on Facebook of when he was at the Taj Mahal. He did have a picture of the building, but he seemed most excited about the monkeys. Wild monkeys all over the place there, which was more exciting than a building, even one as beautiful as the Taj Mahal. (He’s vegan, can’t you tell?) He also mentioned that there are wild peacocks everywhere. He hadn’t learned anything specific about them, but it reminded me that I always mean to look up more info on them. So I finally did, and I learned that peacocks have a lifespan of about 20 years in the wild. 20 years! That is pretty cool. 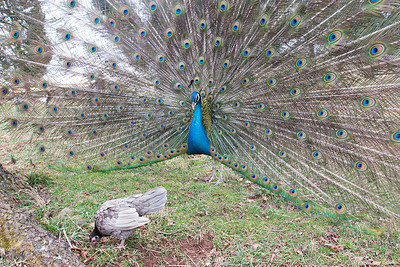 I was surprised to learn that their extensive plumage isn’t a factor in the peahens mate selection. That they seem to be oblivious to it! This made me chuckle, because it would explain why Edward is so unperturbed by all of his romantic interests ignoring his impressive display. 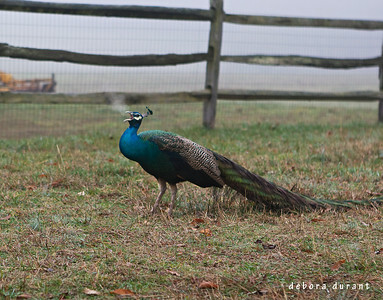 However the next article I read (a more recent one at that) said that peahens do, indeed, care about the plumage. They’ll select their mate from among those with the normal number of eye spots, and bypass those who have less than the normal number. 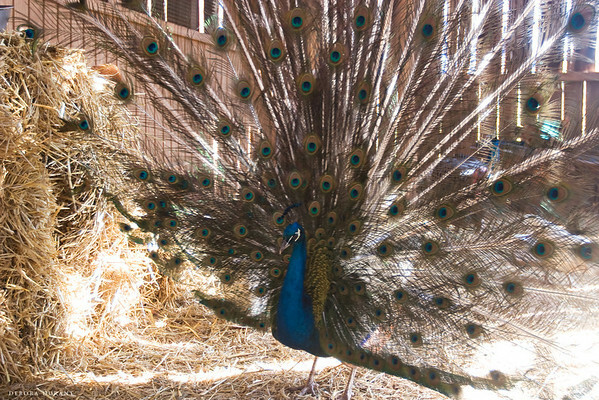 Given the somewhat conflicting information, I’m not sure I’ve really learned anything about peacocks plumage, other than the fact that flying dinosaurs had more elaborate mating rituals than peacocks. I did actually learn some other useful information. The colorful tail feathers aren’t really the tail – they are the tail coverts, and are more accurately called the train. 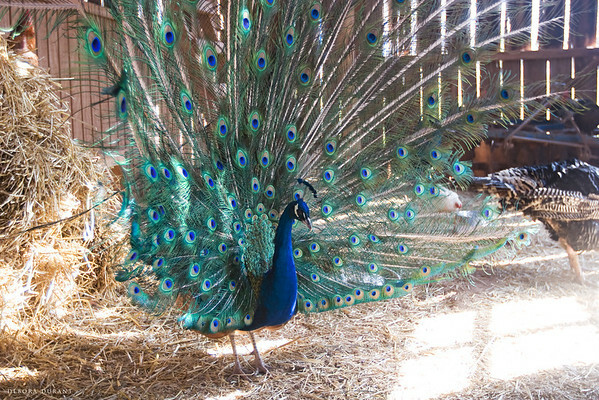 The peacock doesn’t have the full plumage until about 3 years old, and it isn’t until they are 5 or 6 years old that it reaches it’s maximum length. Also, peafowl have 11 different calls. The most distinctive one is the very loud “may-awe” type sound. I love when they do that, though it can make conversation difficult! 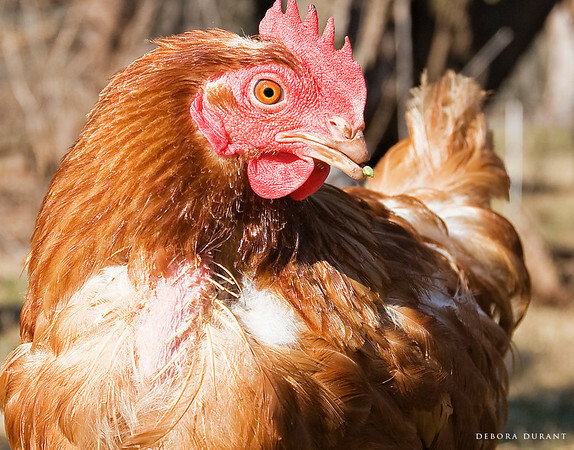 Chickens have even more calls – they have 30 different calls! 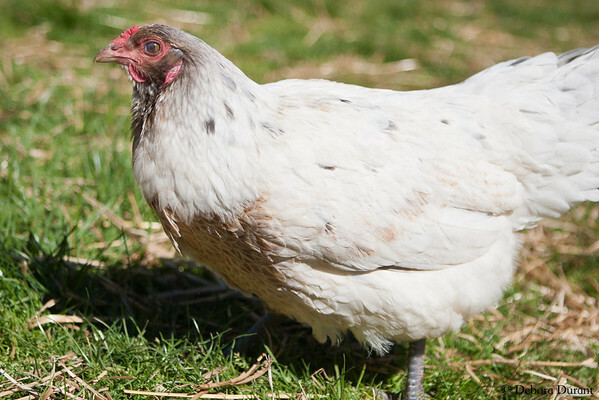 Jonathan has mentioned that chickens not only have alarm calls, they have different alarm calls for small, medium and large predators. I looked it up to get more details, and ended up on a google books result for one of his own books, The Exultant Ark! I need to read his books more carefully, since I had missed that. But I admit I was so distracted by the gorgeous pictures throughout the book that I likely missed a lot of the text. There have been a lot of hawks around lately, so the chickens have needed to be closely supervised when out in the yard. We spent quite a bit of time on Saturday just hanging out in the chicken yard, enjoying the gorgeous (for winter) weather and the happy antics of the chickens and turkeys and peacocks. Ruby caught my eye, with that piece of grass on the lower half of her beak. 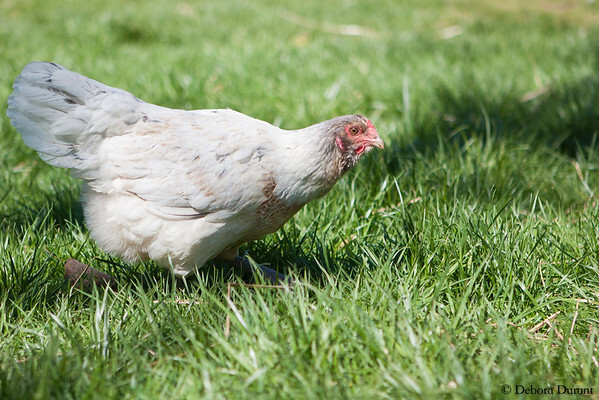 She is a classic case of a debeaked hen, and that piece of grass illustrates how crippling that debeaking really is. Ruby is a Rhode Island Red hen, a breed used for egg-laying. 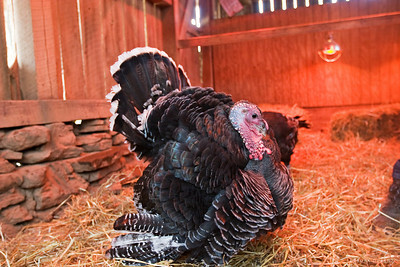 The debeaking was done because she was being used for the eggs her body would produce, and because she was going to live in such cramped quarters in such a stressed social environment that it was expected that she would hurt nearby hens with her beak, and be hurt in return, if she didn’t have that beak chopped off. She was slated, like all egg-laying hens, to be killed after a few years, when her egg production dropped off. 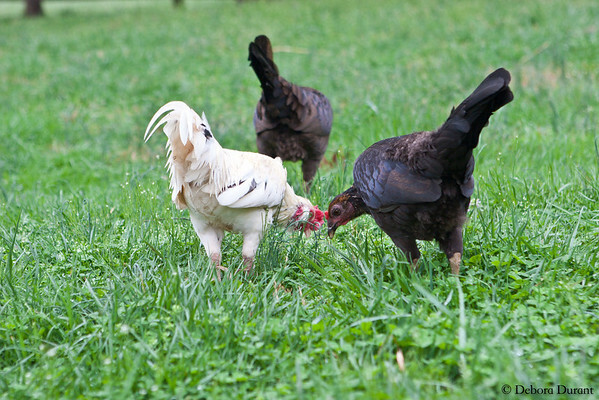 It is worth noting that the factory farms typically use the White Leghorn breed, not the Rhode Island Reds. 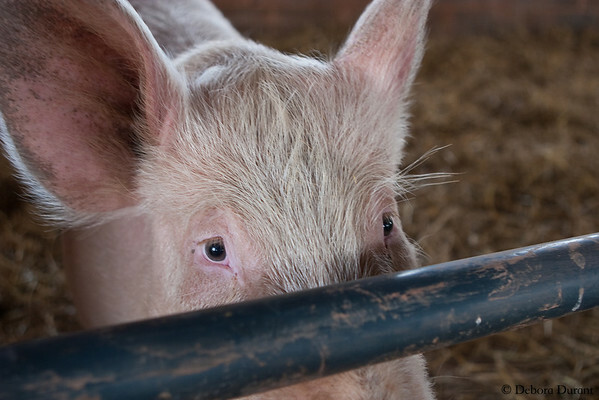 We might not know Ruby’s entire early history, but it’s unlikely that she came from a factory farm. She almost definitely came from a smaller operation, perhaps a “small family farm”, the type that gets romanticized so passionately. But exploitation is exploitation, and the difference between a factory farm and a small family farm is simply scale. It was learning, in the most vague terms possible, of the truth of then-nameless chickens like Ruby that had me leap from vegetarianism to veganism. Eggs are not a compassionate food. Yet another week missed! This time I had a much better excuse – I was off in warm (if not sunny) Florida visiting Mary. We made bagels and butter and burgers and cookie dough dip. I very slowly won the shy Stanley over so that on my last day he actually approached me for some head scratches. I would have done a victory dance if it wouldn’t have freaked him out! He’s a sweetie, just very cautious around people he doesn’t know. Baby Sky is (still!) the cutest happiest kid in the entire universe. (Except for yours, of course!) I was amazed over and over at exactly how much a 19-month-old understands of what the people around her are saying (it’s got to be about 90%! ), and how effectively she can communicate with few spoken words and a couple dozen signs. She taught me the sign for “more” in about 3 seconds, and trained me to read books to her or draw on the patio with her by asking with nothing more than a look. How do they do that? I’m around kids almost never, so I’m not well-versed in interpreting kids, yet I’d find myself following her out to the patio without understanding quite how I knew she wanted me to go out and draw with her! Mind control is the obvious answer, right? In addition to the mind control, Baby Sky is pretty amazing in other ways too. 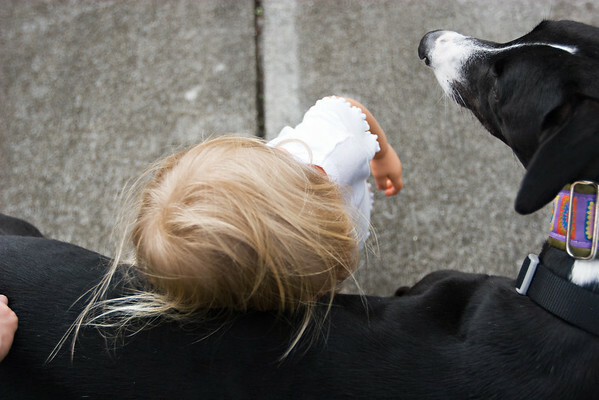 She loves animals, and that love has been encouraged and nurtured. Whether a lizard, a bug, a squirrel, a cat, dog or bunny, she is thrilled to be around them all. It’s easy to see how vegan kids become the most natural and fiercest advocates. Mary participated in a podcast recently on AR Zone, where she talked a bit about vegan parenting in addition to other interesting topics. Well worth a listen. Of course as soon as I got back from Florida the weather took a turn for the worse. Saturday at the sanctuary was cold and we had snow flurries most of the morning, but it was still good to be back. I even got to see something that I hadn’t seen before – a female turkey displaying! It’s apparently a sign of dominance, and not all that common. It was pretty cool, Cosette was strutting around, doing the puffs of air. But unlike Victor or Hugo, she’d sit right down if you started petting her. Tilly and Cosette have turned into little love bugs! The weekend before last there was an ice storm, so no sanctuary visit. It is only January and already I have missed a week! This past weekend the weather was chilly but still nice. We have a couple new regulars on Saturdays now. One is young man, Eric, who went vegan just a few months ago, after seeing Forks Over Knives. It’s always interesting to pick the brains of people who are new vegans, and to see the various influences that led them to veganism. He was talking a bit last weekend about his transition, which was about as abrupt as possible. He went to see Forks Over Knives as an omni, and while he was in the theater watching the documentary, he basically said to himself, “well, that’s it, you’re going vegan.” And he did. Hearing stories like this always makes me wonder how it is that there are people like Eric (who is into weight-lifting, and had been “the biggest meat eater” by his own description, prior to going vegan) who make that connection at lightning speed and change their life to realign with their new-found convictions, where I can only assume that the vast majority of people sitting in that room with him either didn’t make the same connections, or simply didn’t have it in them to act on it, despite being presented with the same information and images. What makes the difference between those who act and those who don’t? Well, that’s the eternal question, I suppose. And it likely has to do with the entire tapestry of their lives, rather than the one snapshot in time. Which leads me to the related question: what made Eric, and the others in that room, choose to watch a documentary that they must have known would present them with information that could have a strong impact, strong enough to convince them to make major changes? Or am I wrong about that? Do people think about that before watching documentaries? Maybe that is just me. The other new regular is a long-time supporter and (occasional) volunteer of the sanctuary, who recently decided to make his volunteering a regular thing. He also happens to be a world-famous author, who writes about pleasure in the lives of animals – Jonathan Balcombe. 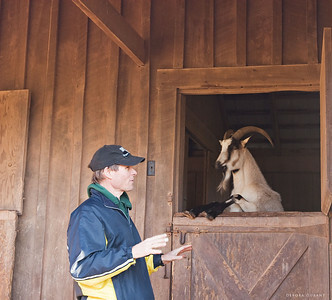 I’ve enjoyed his books and always enjoy talking to him when I see him at the sanctuary, so I know it will be fun to hear some of his observations of the animals as we do chores, especially as he gets to know them more as the weeks go by. 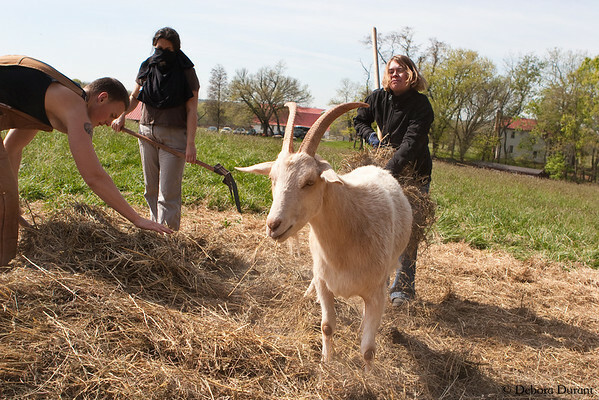 Marius is the king of the hill in the goat yard, but in my experience he’s really sweet to the humans in his area, even as he chases upstart goats around. Contrast this to Lenny and Jeremy, who seem to think that we are goats, and who we’ve learned to not turn our backs on! We often have to put them in one of the stalls while we clean the yard. Bad boys! 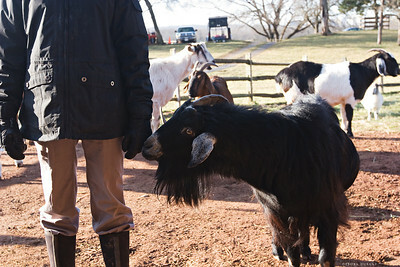 But Marius, when he’s not sweet-talking the girl goats, will do his best to get his share of attention from us. Last week I happened to capture a couple shots as he approached Amy. It reminded me of how our dogs and cats will act, moving so that the conveniently free hand dangling at the side of the human just happens to end up right on their head or neck or back, and the human typically will start petting them. That’s exactly what Marius did, and of course it worked like a charm. Hamlet did his usual “come pet me” grunt as we were emptying our buckets from the horse barn into the spreader. Hamlet is such an interesting case, because he’s – I hate to say it – the ugliest pig you have ever seen. He has weird flaky dry skin, and this funky hair that goes in all directions at once and seems to trap just about everything imaginable in it. (Last weekend it was food pellets in addition to the usual hay and grass!) 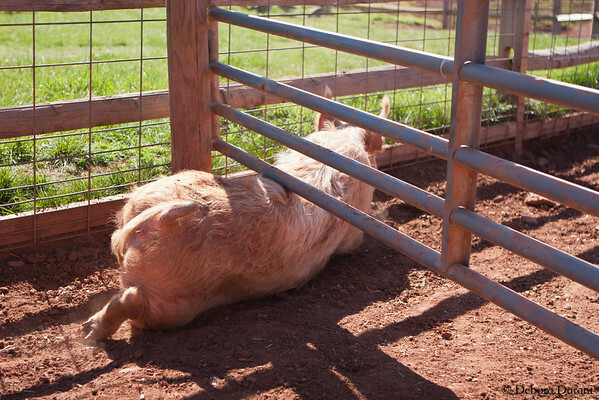 He tends to be off doing his own thing, and doesn’t really come up and ask for attention…until we’re out of the pig yard. He knows that we’ll be emptying the muck buckets from the horse barn into the spreader right near the pig yard, so he’ll go and wait and get attention then. Perhaps he likes that there will be no other pigs around to compete with for attention. 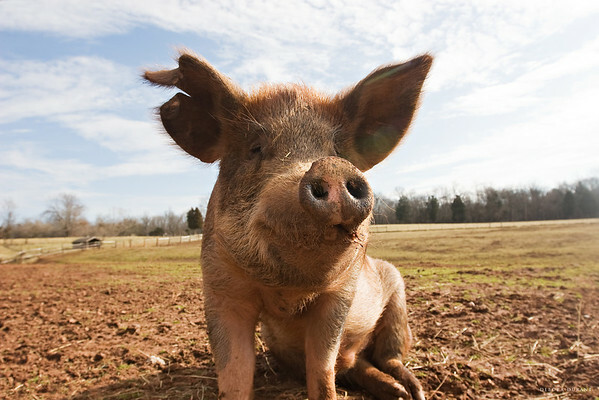 For whatever the reason, I think many of us have a soft spot in our hearts for this particular pig, who is so ugly he comes right back around to being cute. 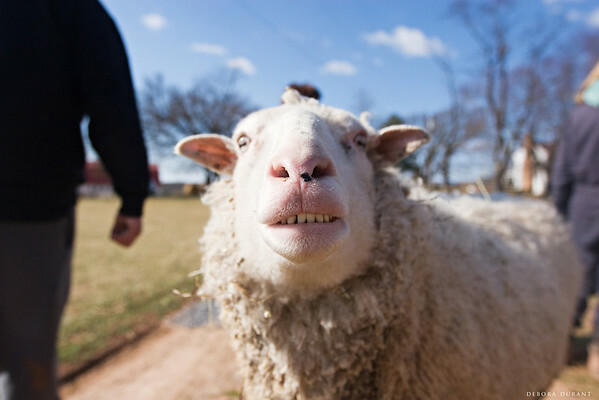 Two different people independent of each other (as far as I know) have come to the sanctuary to visit with the animals and to choose who to sponsor, and have ended up sponsoring Hamlet specifically because he looks so ugly! I thought I’d told his full story in an earlier post, but now I can’t find it. Figures! The short version is that he was bought to be killed for a pig roast, but that particular year there was a delay between when they brought the pig home and when they were to kill him…and in those few days, with Hamlet following the people around like a dog, they decided to release him to Poplar Spring instead of killing him. The wife of the couple came to PSAS periodically to visit Hamlet for a few years, and always insisted that Hamlet was different, that he was special, that he (and he alone) had “deserved” to be saved from being killed. Essentially he’s the last pig you’d really expect someone to put the hat of exceptionalism on, and yet the people who bought him did exactly that. Whatever this blog accomplishes (and I’m never sure exactly what it might accomplish), I hope that it shows people that these animals have individual personalities. They are not machines, they are not automatons, they are not commodities, and they are not products. They are individuals, and they have their own likes and dislikes, their own wants and joys and disappointments, they have all the idiosyncrasies that comes along with being an individual. And yet, they are not exceptional. They aren’t the chosen few who “deserve” to be rescued while the rest “deserve” to die. These rescued residents are all just like the billions who are not as lucky. All of those billions “deserved” to be rescued, they all have lives they want to live, they are all individuals, and they all want the same thing as we do – to live, free of harm, free of exploitation. 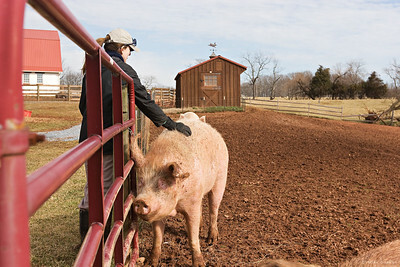 At sanctuaries, we meet those lucky and rare rescued few. We meet those few we’ll ever be lucky enough to get to know. It was a little chilly this weekend. Icicles hanging from the brush used to clean the water buckets in the goat yard were a good clue, in case we weren’t already huddling in our winter layers! 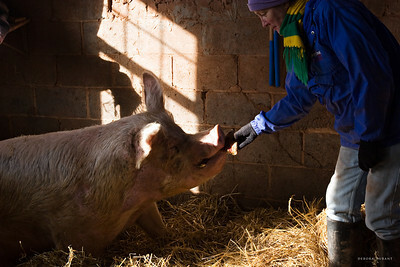 Leesa, one of the regular Saturday volunteers, brought pizza for Parker, an elderly pig who has been getting picky with his breakfast in recent weeks. General consensus is that it’s mostly that he has learned that if he refuses his breakfast he’ll get some treats. So he’s spoiled, and why not? If anyone deserves to be spoiled in their old age, it’s these great big gentle pigs, dealing with arthritis with a remarkably happy spirit. 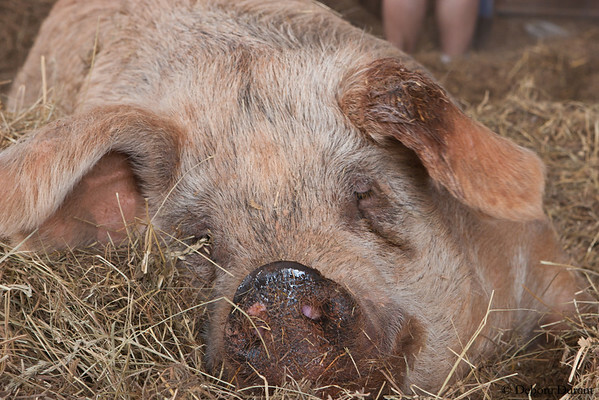 Parker is one of the sweetest pigs at the sanctuary (I say this about a lot of pigs, I realize! ), and he’s the special favorite of Leesa. So when she heard that Parker had eaten with gusto a pizza brought for him last week by one of the weekday employees, she picked up a pizza for Parker for Saturday. She waited until we were all in the pig barn before feeding it to him, lucky for us! Nellie was being pretty goofy. 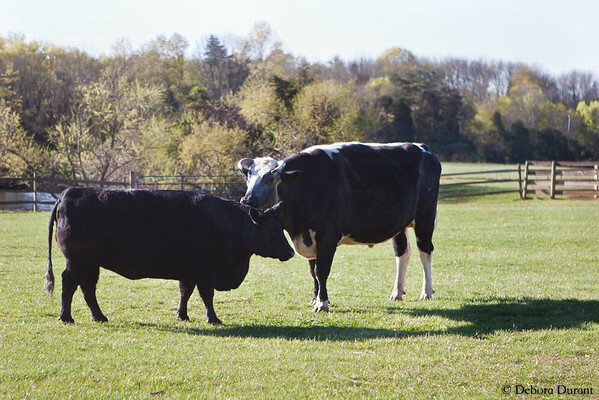 She’s grown so much since she came last year – she’s almost as tall as one of the adult female dairy cows, Lily, and I don’t think she’s done growing yet! 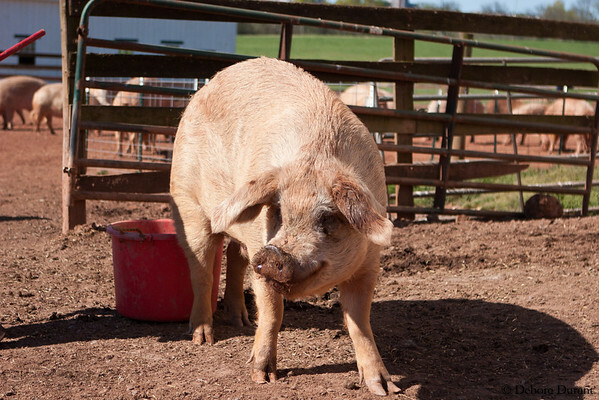 When I was emptying a bucket into the spreader, one of the pigs by the fence grunted at me. That’s pig for “Hi! I’m over here and I’d love a back rub!” So as I was scratching him through the fence, Nellie was curious to see what I was doing. She ended walking right over the trailer hitch a few minutes later, something that I don’t think any of us have ever seen before! 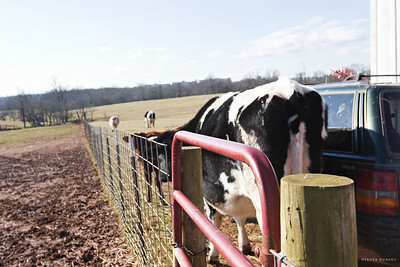 She checked out the pig yard through the fence, but I don’t think she figured out what had drawn me over to the fence. She and Aggie were pretty cute checking it out though. The young deer came through the chicken yard again, but spent most of the time hanging out in the woods with a couple friends. We didn’t even see the other two deer at first – they were laying down, relaxing, and it was only when they moved their heads that we noticed they were there. It’s not often we see them so relaxed. Perhaps it has to do with the fact that we weren’t hearing guns going off? 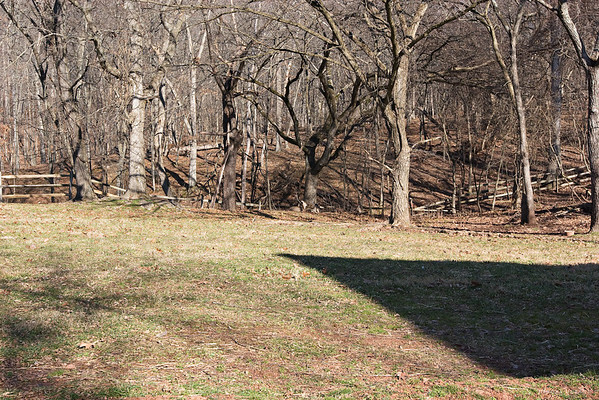 Perhaps they simply know that the humans hanging out near the chicken barn are no threat at all. Can you see the three deer in the woods? Click to see a bigger version. It’s that time of year when the peacocks display constantly. To anyone, and everyone, and sometimes just to leaves or blades of grass. Up until very recently, Edward was obsessed with one of the guinea hens at the sanctuary, Angie. This had been going on for a couple years. She’s mostly indifferent to him, but his devotion has caused a lot of conflict between Edward and the male guinea, Gerald. All the guinea girls are Gerald’s domain, from Gerald’s point of view. Well, this past weekend Edward seemed a lot more interested in Tilly and Cosette, the young turkey girls! And when Irene, a little hen, was nearby, he was happy to display for her also. I moved to a vantage point to catch some of it in pixels, and it was a bit of a comedy at that point. Irene was ignoring Edward and concentrating on looking for food in the grass, so he was coming closer and closer to us both, rattling his tail feathers. Meanwhile Tilly was very interested in the little Flip video camera I was using (you’ll see in the video! ), so she was coming up to me and pecking at the camera. Cosette approached from my other side, pulling at my coat, pulling things out of my camera bag, and finally pulling some of my hair out of the haphazard knot I tie it in. It was really hard not to laugh! I was trying to hold the video steady all the while this was going on. We had another visitor to the chicken yard as well. 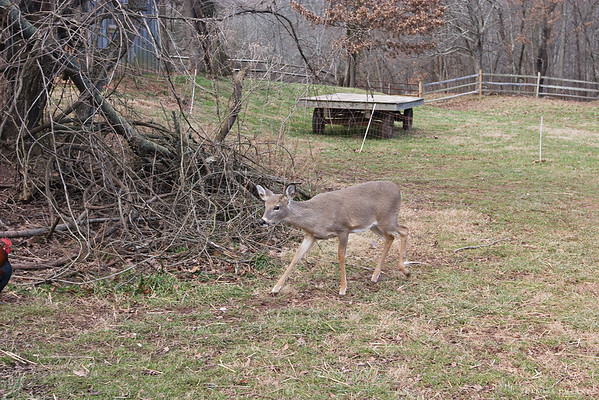 One of the deer who was born on the sanctuary in the spring, who tends to hang around the chicken yard and will walk right into one of the barns to finish off the crumbs of the leftover chicken food, came around while we were working in the chicken barn. I love seeing these sanctuary deer. I like to think that they know they’re safe at the sanctuary. If only they were safe everywhere.